Home › Ask A Pediatrician › Media and Technology › Immunization Records – There’s an App for that! Immunization Records – There’s an App for that! I see parents use their phone everyday as a tool to keep their children healthy. They put appointments in their calendar, or for example, track feeding and sleeping schedules. 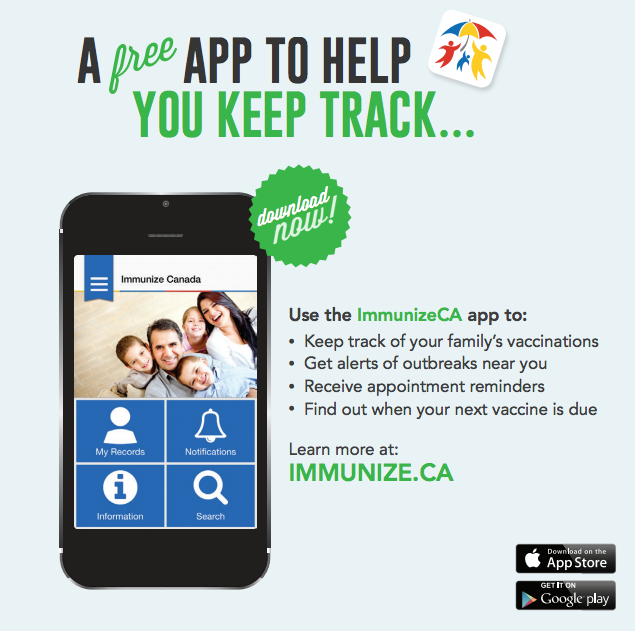 Now finally, there is a Canadian specific app to keep track of your child’s immunizations. 1. It works for the whole family (adults and children). 2. It syncs with your calendar. 3. You can customize it for the immunization schedule that your province follows. 4. You can receive alerts about outbreaks of communicable diseases in your area, understand your vaccine-status against these diseases, and learn how you can protect your family. 5. You also have access to useful information about vaccines in general – there are fact sheets, tips on how to reduce the pain of vaccination, and information about travel vaccines. It is free for all Canadians and available on most platforms (Android, Google, and Blackberry). I’m going to download it for myself now! Enjoy!